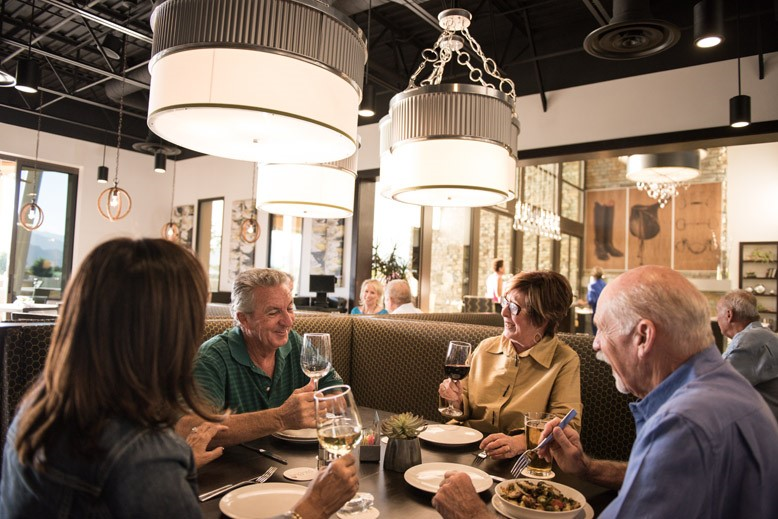 June Hill’s Table, the east valley’s new favorite restaurant, is celebrating Greater Palm Springs Restaurant Week (June 2-11) with specially created and priced lunch and dinner menus. Enjoy a three-course lunch for $15 or a three-course dinner for $29 (taxes and gratuities not included). Executive Chef Kevin Land has prepared enticing menus for both lunch and dinner including starters, entrees and desserts. Everything at June Hill’s Table is made from scratch daily using locally sourced ingredients when available. Guests at June Hill’s Table enjoy both indoor and outdoor dining, with stunning 270 degree views of the surrounding mountains. June Hill’s Table is located at Trilogy at The Polo Club in Indio, near the edge of La Quinta on Avenue 52, just east of Monroe. For reservations, phone 760.775.5522. June Hill Robertson McCarroll arrived to the Coachella Valley in 1904 as the nurse wife of the regional leader of the Southern Pacific Railroad. Over time, her skills advanced and she became the lone physician in the eastern portion of the valley as well as the host-in-residence of the Southern Pacific Depot Station & Hotel, the area’s only proper lodging. June Hill never wavered from her commitment to ensuring that all guests of the Depot had an exceptional experience. Known as the “hub of the valley,” the Depot was the center of all social life in the desert, with a formal dining room and Friday night dances. A renaissance woman who was thirsty to learn and improve her surroundings, June Hill famously stumbled upon an idea that would become her most lasting legacy. On a medical call in Indio, a driver coming from the other direction ran June Hill off the road. This incident birthed for her the idea of painted lines to separate traffic on roadways, an advancement that she championed all the way to Washington, D.C., ultimately to see it adopted throughout the nation’s roadways. Today, June Hill’s Table strives to honor June Hill by creating locally inspired dishes that challenge the status quo and always keep you wanting more.